I love books. I love drawing. I double-plus love sketchbooks. Sketchbooks are highly personal things – private places to record and work on ideas. They become a visual diary of what one was doing at a certain point in time. They aren’t the finished art, yet they certainly can be as interesting. 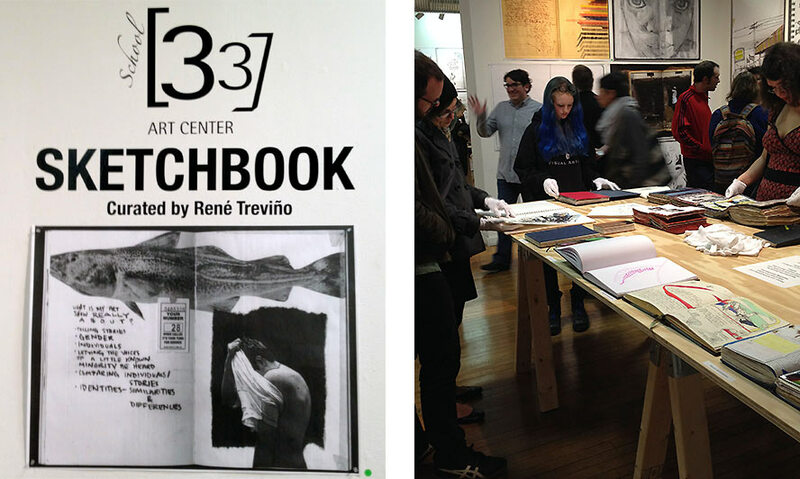 René Treviño, Exhibitions Coordinator at School 33, has organized a great show of local artist sketchbooks. My current sketchbook is in the show. Curated by School 33 Exhibitions Coordinator René Treviño, “Sketchbook” is an interactive exhibit showcasing the sketchbooks of a wide range of artists from the Baltimore area and from throughout the United States. As an artist and curator, Treviño sees sketchbooks as a safe place for artists to collect ideas, hone skills, brainstorm and plan. Often they become rich documents that reflect a specific time or period of development in an artist’s practice. “Sketchbook” is a presentation of over 100 sketchbooks created by 33 artists. The public is invited to browse and flip through these never before showcased works. Opening reception is on November 8, 2013 from 6pm-9pm. Participating artists include: Peter Abrami, Carrie Beall, Ed Bisese, Nicoletta de la Brown, Andrea Chung, Eileen Cubbage, Paul Daniel, Linda DePalma, Emily Dennis, Mark Eberhardt, Peter Eide; Matthew Fishel, Matthew Freel, Mitchell Goodrich, Caitlin Harris, Megan Hildebrandt, Alexis Iammarino, Tracy Jacobs, Jim Doran, Jeffrey Kent, Matthew Kern, Matthew Langley, Lori Larusso, Todd Matte-Frye, Greg McLemore, Pierrette Montone, Katherine Nonemaker, David Page, Andrew Shenker, Jonathan Smith, Judy Southerland, Sarah Templin, and Jordan Tierney.